In Algeria: Hostage Crisis Reportedly Turns Deadly : The Two-Way Events are happening quickly at the oil field where Islamist militants have been holding a large group of hostages, apparently including some Americans. The kidnappers are retaliating for French military action against militants in neighboring Mali. 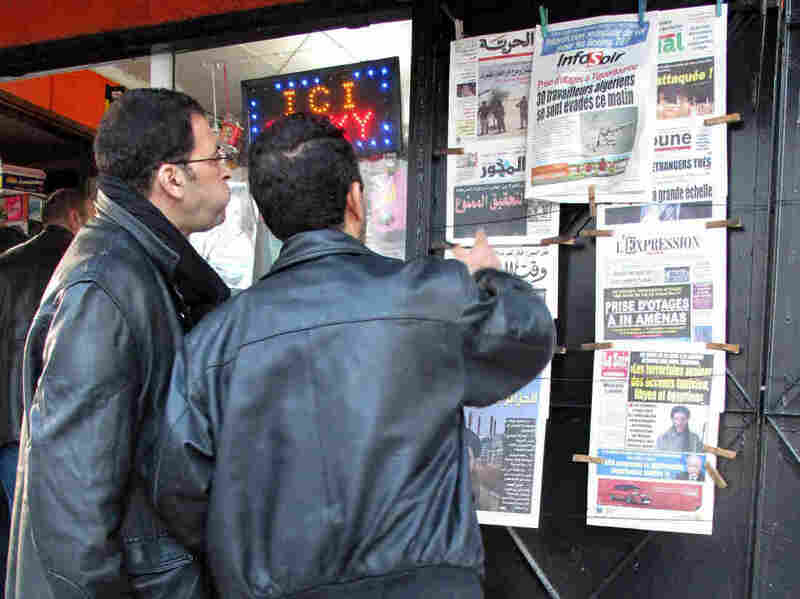 Algerian men look at national newspapers headlining the terrorist attack and kidnapping in Amenas at a news stand in Algiers on Thursday. Events are happening quickly at the gas facility in eastern Algeria where Islamist militants seized a large group of hostages — perhaps as many as 41 of them foreigners who apparently include some Americans — on Wednesday. "The news all day was coming from the Algerian media and Islamists websites, but was difficult to confirm with other sources because of the remote location of the facility. There were no Western journalists flocking to the site because Algeria is a very closed country and the government wasn't giving out any entry visas. Most French stations were getting information and reports from phone calls with local journalists hundreds of miles away in the capital of Algiers." Update at 3 p.m. ET. It's Over? Sky News reports that "Algerian state news agency says hostage situation is now over." But we should remind everyone: There are many reports and lots of conflicting information. We're aiming to sift through it all as best we can. As the BBC adds, "the number of deaths and injuries is unknown." There are multiple reports that during a Algerian military operation aimed at freeing the hostages, some of the captives as well as some of the militants were killed. An American surveillance drone is flying over the area where the hostages are being held, a source with knowledge of the situation tells NPR's Tom Bowman. Reuters reported that information earlier. With an Algerian military operation apparently underway, there's word from The Associated Press that the militants claim more than 30 hostages were killed by "military helicopter strafing." But that number wouldn't seem to make sense if earlier reports about many hostages escaping are correct. As we've been saying, there are many reports and lots of conflicting information. We're aiming to sift through it all as best we can. -- Algeria's state news agency says a military operation to free the hostages is under way, that at least four were freed, but that there have been a number of "victims," the BBC writes. -- Reuters says "25 hostages escaped and six were killed" when Algerian forces moved in. Again, there are many reports and lots of conflicting information. We're aiming to sift through it all as best we can.